The U.S. federal government awards more than $600 billion in grants each year1 to state agencies, local and tribal governments, and nonprofit organizations. To ensure grantees’ accountability for their use of taxpayers’ money, federal grants trigger a complex array of reporting requirements. These post-award reporting requirements are administered separately by thousands of programs, spread across dozens of grantor agencies, and governed by hundreds of different laws. Federal grant reporting is broken in two distinct ways. First, it does a poor job of delivering transparency to agencies, Congress, and taxpayers. There is no central repository of all the information that grantees report to grantor agencies. There is no meaningful way to aggregate the entire government’s, or even an entire agency’s, grant reports to ensure compliance or compare performance. Second, grantees sustain unacceptable compliance costs. Grantees must fill out reporting forms, often providing the same information multiple times, in an atmosphere of uncertainty and arcanity. Most grant reports are documents: grantees must compile and submit forms to apply for, receive, and report back on their grant awards. Even where grant information is submitted electronically, electronic submission tools still typically rely on plain-text fields based on the paper documents that they recently replaced. Federal grant reporting is outdated when compared with other areas of government reporting. Around the world, governments are choosing to transform document-based regulatory reporting into open data, in which all information is expressed using standardized data fields and formats. Open data can be instantly aggregated for transparency and accountability. Open data can often be compiled automatically, with software pulling the needed information from internal systems. By replacing document-based regulatory forms with open data, the government of Australia saves Australian companies over $1 billion annually, because the companies’ software can automatically generate and submit regulatory reports to multiple government agencies at once. a central repository housed within the Treasury Department on May 9, 2017. The DATA Act has created a single, unified open data set that represents the whole government’s spending, delivering instant information to agency leaders, Congress, and taxpayers, while also enabling software to automatically report and validate spending information. Open data can deliver the same transformation in federal grant reporting as has already begun in Australian regulatory reporting and U.S. agencies’ financial reporting. If the federal government adopts a standardized data structure of common data fields and formats, applies that structure to all of the reports that grantees must file, and publishes all of this information as open data, then the central problems of grant reporting can be solved. 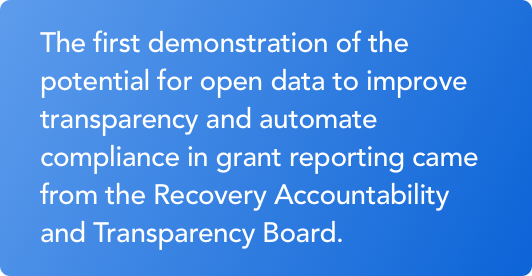 The foundation for open data in grant reporting already exists. The Department of Health and Human Services has created a dictionary of data fields, known as the Common Data Element Repository Library (CDER Library), that could be expanded into the necessary government-wide data structure. But to allow information to flow freely to government and taxpayers, and to reduce grantees’ compliance costs, the government must expand that dictionary, support its use, and, ultimately, require all grant programs to conform their information collections to it. This paper describes the current state of federal grant reporting, explains the promise of open data to improve information delivery and reduce compliance costs, recounts the relevant history of federal grant policy change, and envisions an open data future for grant reporting. Post-award grant reporting is document-based – which makes the system, taken as a whole, more complex, more costly, and more impenetrable than it should be. Second, all grantees must register with the System for Award Management (SAM), which is maintained by the General Services Administration. Third, prime grantees – those using federal grant funds to award sub-grants to sub-grantees – must report on their sub-grants to the Federal Subaward Reporting System, which is part of SAM.4 Forth, under the Single Audit Act, all grantees receiving more than a prescribed total in federal grants must undergo a combined audit, and report their audit results to the Federal Audit Clearinghouse, which is maintained by the Census Bureau on behalf of OMB.5 The current state of post- award grant reporting is summarized in Infographic 1. In fiscal year 2017, the federal government made $662.7 billion in grant awards,6 funding nearly 2,300 grantmaking programs at 70 agencies.7 Mandatory health spending made up a majority of these expenditures. The remainder, about $277.6 billion, still represented more than 7% of the total federal budget. Federal grants fund a wide variety of priorities – everything from environmental mitigation, income security programs, and early childhood education to transportation projects, community redevelopment, job training, and social services. While grants are often thought of as the purview of either the Department of Health and Human Services (HHS), the arts, or research, there is no federal department that does not contain at least one of the more than 70 federal grantor agencies. The multiplicity and diversity of grantor agencies and grantmaking programs, all governed by hundreds of different laws, makes it difficult to comprehend the federal grant ecosystem system as one unified whole. Department of Transportation grants for infrastructure improvements have very different goals, stakeholders, and governing laws from grants for body armor administered by the Department of Justice. And these have very little in common with National Institutes of Health research grants to study disease or U.S. Agency for International Development grants build entrepreneurial capacity in foreign countries. Even within departments, the goals of their grantmaking programs can vary widely. For example, Federal Emergency Management Agency (FEMA) emergency grants have very little in common with Science and Technology Directorate research grants, even though both originate within the Department of Homeland Security (DHS). Within Departments, separate Offices and Agencies each have their own administrations, priorities, and portfolios, and often their own technology, software, and systems, award grants. Frequently, their grant systems and processes were designed piecemeal, and for particular purposes, often not fully integrating into those of their larger organization, and creating significant siloes and challenging structural impediments. Beyond the varied systems and capacities of the grantor agencies, there are also different grant agreement categories, including multi-year, renewal, extension, and cooperative, each carrying different reporting requirements and any or all of which may be in use by a given grantor. Moreover, each individual grant program can come laden with its own terminology - one which further complicates the already fractured vocabulary used between budget activities and financial reporting. An internal survey of terminology used in grant reports at HHS alone uncovered eight distinct definitions of a congressional district,8 and this is by no means a unique problem. The diversity of federal grantmaking creates complexity in grant reporting. States, local and tribal governments, universities, and large nonprofits often receive grants from many different grantmaking programs, each with its own administrative and reporting requirements. Most federal grant reporting takes place by means of document-based forms, usually completed and submitted in the PDF format. Some agencies have created grant management systems that allow grantees to submit information using web forms and similar means. However, these systems still mimic the document-based forms that they replaced. 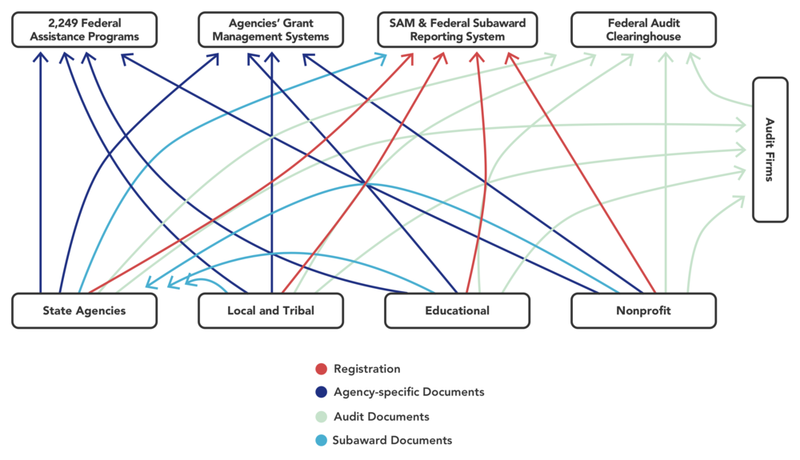 Overlap between the agency-specific reporting requirements and the other categories – SAM and the Federal Audit Clearinghouse – further contributes to the complexity facing grantees. Even if a grantee has already submitted financial information to the specific agency and program office administering a particular grant, it often must again submit the same information to SAM and to the Federal Audit Clearinghouse. In addition to their overlapping complexity, reporting requirements are often poorly-defined. A survey of grant reporting forms used by the Department of Health and Human Services showed that approximately 90% did not define their terms or specifically describe their fields. For example, most forms did not specify whether a date should be expressed numerically (12/24/1942) or written out (December 24th, 1942). The document-centric nature and the substantive complexity of federal grant reporting impose burdens on grantees and create challenges for federal oversight by agencies and Congress. State agencies struggle with these issues as much as other grantees do, and with an added twist: they are both federal grantees and organizational grantors in their own right. State agencies’ program administrators must ensure not only their own compliance with reporting requirements but their subgrantees’ as well. And they must aggregate information they receive from their subgrantees into their own reporting to the federal government, all while maintaining compliance with their state’s individual statutory requirements. Moreover, the majority of grant reporting forms, including the commonly-used SF-424 and -425 for Federal Financial Reporting, are mostly transmitted from grantees to grantmaking program offices as static PDF documents. Static PDF forms cannot feed directly into searchable databases. Information must be extracted and translated into searchable data before it can be aggregated. Each such extraction and translation becomes a separate, freestanding project. The vague definitions of federal grant reporting forms further contribute to grantees’ burden and grantors’ challenges. When the specific information requested by a particular blank on a grant reporting form is unclear, grantees face risk responding to it. Within individual federal programs or offices that directly fund activities, the lack of definition or prescribed formatting may not be a pressing problem, as each office or agency presumably knows what they mean by the terms in their own forms and can communicate those needs directly to the grantee performing the work. But at higher levels of aggregation, across program offices, agency-wide, or government-wide, grantor agencies and Congress cannot draw meaningful conclusions. With high compliance costs burdening grantees and major challenges facing agencies and Congress in their oversight, widespread cynicism about the benefits of grant reporting has emerged. Many grantees view compliance as little more than a necessary evil: it is annoying, frustrating, and provides no return on investment beyond not disqualifying themselves from the next funding cycle. Duplicative and vague reporting requirements are bad enough for grantees, but the perception that grantor agencies do not do anything with the information that they receive adds a significant element of understandable frustration. From the grantees’ perspective, the information they compile and report disappears once it has been delivered to a grantor agency. It must be re-entered in the next funding cycle; it does not automatically appear in other agencies’, or even other programs’, reporting systems; and the lack of structure makes it extremely difficult for grantees to leverage the data themselves. The compliance burdens shouldered by grantees and the transparency challenges faced by grantors share one ubiquitous common cause: from compliance culture to duplicative burden, and from unreliable baselining to unspent grant funds, all roads lead back to disorganized data. But data technologies are now ready to address the inherent problems of the current system of federal grant reporting, to the benefit of grantees, grantors, and the public. By adopting a government-wide open data structure for all the information grantees report, the federal government can reduce burdens on grantees, enable grantor agencies and Congress easy access to data for oversight, and improve the whole system to the benefit of all its constituents. In other words, the federal government should replace document-based forms with standardized, open data. This recommendation is very different from forcing agencies to adopt the same forms, or the same substantive reporting requirements, across their diverse programs. An open data structure could accommodate all manner of disparate reporting requirements, preserving necessary diversity while still allowing software to deliver the right data to the right recipients. A government-wide open data structure covering all the information grantees must report will facilitate the automated compilation and submission of such information while enabling cross-program and cross-agency transparency for grantor agencies, Congress, and the public. As a result, an open data structure will reduce grantees’ burden, resolve agencies’ and Congress’ oversight challenges, and thereby benefit all the constituencies served by federal grants. First, data standardization will allow grantees’ software to automatically compile and submit reports. Financial reporting requirements typically call for information that can be extracted from grantees’ financial systems – but because such requirements are expressed as unstructured blanks in document- based forms, rather than as well-defined electronic data fields, software vendors are unable to build systems that can reliably compile the exact financial information that is required. Performance and programmatic information might be less likely to already reside in grantees’ systems. Never-the-less, if data fields are standardized consistently across multiple agencies’ and programs’ reporting requirements, once a particular data field is reported software will be able to automatically fill in the same field in all other instances where it is required. For example, if a grantee providing a school lunch program must report the number of students who qualify for assistance over a particular time period, data standardization will allow software to automatically populate that field for every grant using the same qualifications once this information is reported for the first time. In this case, automation could be used to identify additional programs these students qualify for but from which they are not currently receiving services, giving the grantee the opportunity to improve outcomes through better insights. Automating grant reporting will not only reduce grantees’ costs and allow analytics for program improvements. By removing human data entry and imposing machine validation, automation will also improve the quality of the information grantees submit, reinforcing their accountability and avoiding manual corrections. Second, an open data structure will allow the federal government to create a single, unified data set covering all grant reporting, bringing cross-program and cross-agency accountability. Program managers in the federal government’s nearly 2,300 grantmaking programs currently have no means of systematically aggregating an individual grantee’s reports to other programs to produce a full picture of their activities – even though such information is usually legally public, often already publicly available (though spread across multiple sources in disparate formats), and would be disclosed in response to targeted, piecemeal Freedom of Information Act (FOIA) requests. A unified data set will make data sharing among program offices simple, automatic, and ubiquitous, thus providing systemic insights on how programs are run, how grant dollars are allocated, how grantees perform, and how funding leads to outcomes. An open data structure will improve grantor agencies’ workflow in other ways as well. Today’s document- based system requires agencies to spend time designing, maintaining, and seeking White House approval for reporting forms.23 With an open data structure expressing – as data fields and formats – the concepts that grantees must report, the intervals of reporting, and the authorities under which the information must be reported, agencies will be able, instead, to create customized reports from grant information, according to need. A government-wide open data structure for grant reporting should be specific, mandatory, nonproprietary, as comprehensive as possible, and governed for the long term. First, an open data structure should predictably specify the fields and formats of federal grant reporting, in a manner predictable enough for software to rely on it. Data elements should have precise definitions: unambiguous, simple, and independent of other elements’ definitions.24 Data formats should clearly identify which data elements must be reported for which purposes and how they relate to one another, permitting automatic validation. For instance, a government-wide data structure for grant reporting would include a format for annual financial reports specifying that all of the different expense categories pertaining to a particular grant must add up to a bottom-line total – allowing software to automatically reject submissions with incorrect math. To the extent practicable, data formats should also specify when information is to be reported, and under what statutory or regulatory authority. If properly designed, a government-wide data structure will remain independent of the systems used by grantees to compile and report their information, and of the systems used by agencies to receive, validate, and analyze that information. Therefore, although imposing a government-wide data structure might require agencies to upgrade their existing grant management systems, it would not force wholesale replacement nor result in a software monopoly or reduce an agency’s ability to select solutions which best meet their individual needs. Second, an open data structure should be mandatory. Grantmaking programs must be required to collect information from their grantees using the data structure, and in no other manner. Program offices should be free, of course, to use web forms, electronic uploads, distributed ledgers, cloud-based management software, or any other technologies to collect grant reporting information, so long as those technologies embed, and enforce, the data structure. Moreover, a data structure need not be made mandatory immediately, or all at once. Instead, it could be phased in over a period of years. Financial information could be standardized before programmatic or performance information. A preliminary period of optional, voluntary standardized reporting could be used. However, all stakeholders should understand that the structure will eventually be fully mandatory. Third, an open data structure should be entirely nonproprietary, and published for the free use of federal agencies, grantees, software vendors, analytics solutions, and transparency platforms. The GAO has reported on the federal government’s efforts to find alternatives to proprietary recipient identifiers, for example.25 If data fields or formats are proprietary, the information cannot be freely downloaded or exchanged.26 A government-wide data structure for grant reporting should utilize a nonproprietary identification code for all grantees, and should avoid the use of any other fields or formats with similar restrictions. Fourth, an open data structure should be as comprehensive as possible. Financial information has already undergone some substantive government-wide alignment, and therefore might be prioritized first, but programmatic and performance information should be standardized, too, wherever possible. Grantees and grantor agencies should have confidence that the data structure expresses all relevant reporting requirements, and be able to trust software built on that structure. Fifth, a government-wide data structure should have permanent governance, with no danger that policy or vendor changes might affect availability. In adopting a government-wide open data structure for all grant reporting, the federal government will have at least two compelling precedents to follow. automatic reporting.28 The Australian SBR program also saves hundreds of millions of dollars for government agencies by eliminating manual processing of regulatory reports.29 Although grant reporting differs from regulatory reporting, the U.S. government can expect similar benefits from a government- wide data taxonomy for grant reporting: reduced burdens for grantees and better information availability for the grantors and watchdogs. The two contexts in which open data structures have been successfully implemented government-wide – foreign regulatory reporting and federal public-sector spending reporting – are similar to the federal grant ecosystem in key ways. First, like federal grants, Australian regulation and U.S. public-sector spending both require the same entity to report overlapping information to multiple recipients: an Australian company must file overlapping reports with tax, labor, and securities agencies, while U.S. federal agencies must report overlapping spending information to Treasury, the White House, and the GSA. In other words, Australian regulation, U.S. public sector spending, and U.S. federal grant reporting are all multipolar reporting regimes. Second, Australian regulation and U.S. public-sector spending are governed by multiple laws, just as the federal grant ecosystem is, and a government-wide data structure could only be imposed and implemented with a government-wide mandate and leadership. To determine how, practically, an open data structure for federal grant reporting could be implemented, it is necessary to summarize the history of grant reporting policy reforms. The Federal Reports Act of 194235 was perhaps the earliest legislation still relevant to grant reporting processes today. The Federal Reports Act granted the White House Bureau of the Budget authority over information requests made by all federal departments and agencies to entities seeking government funding. Under this authority, the modern White House OMB acquired, and still maintains, jurisdiction over grant reporting. Two offices within OMB exercise this authority. First, the Office of Federal Financial Management (OFFM) “leads development of governmentwide policy to assure that grants are managed properly and that Federal dollars are spent in accordance with applicable laws and regulations.”36 Second, as discussed below, the Office of Information and Regulatory Affairs (OIRA) reviews and approves grant reporting forms used by agencies to collect information from grantees. Since the passage of the Federal Reports Act, Congress and OMB have frequently attempted to address the diversity of grantmaking and grant reporting through government-wide policy reforms. The seven major policy reforms of the past quarter-century are the Paperwork Reduction Act of 1995, the Single Audit Amendments Act of 1996, the Federal Financial Assistance Management Improvement Act of 1999, the Government Performance and Results Act - Modernization Act of 2010, the Digital Accountability and Transparency (DATA) Act of 2014, the late-2014 implementation of OMB’s Uniform Grant Guidance (and related policy memos), and the Grants Oversight and New Efficiency (GONE) Act of 2016. Five out of these six reforms sought to modify the substance of grant management or grant reporting. Only the DATA Act sought to address the data structure of grant reporting. In 1995, the Paperwork Reduction Act37 recognized the existence of the Office of Information and Regulatory Affairs (OIRA) within OMB, and tasked this office with “the review and approval of the collection of information [by federal agencies] and the reduction of the information collection burden.”38 Under the Paperwork Reduction Act, OIRA reviews and approves all of the forms and processes federal agencies use to collect information and data from non-federal respondents, including both surveys and all reporting forms for contracts and grants. The Paperwork Reduction Act allows OMB, through OIRA, to prescribe the content of grant reporting forms such as the SF-425. However, this authority has not been employed to specify the data structure of grant reporting forms, and every change triggers a months- long approval process. 2014: Uniform Grant Guidance [https://www.gpo.gov/ fdsys/pkg/FR-2013-12-26/pdf/2013-30465.pdf] and OMB Memorandum M-14-17 [https:// obamawhitehouse.archives.gov/sites/default/files/omb/ memoranda/2014/m-14-17.pdf]. The Single Audit Act Amendments of 199639 were implemented to streamline and simplify the process set out in the original 1984 law40 for audits of the recipients of grants. To prevent grantees receiving grants from multiple federal sources from having to undergo separate audits for each funding stream, the Single Audit Act allows entities receiving total federal grants funding over a set amount to undergo just one annual organizational audit and report that audit to the Federal Audit Clearinghouse.41 OMB sets this threshold, currently $750,000 in total awards in a given year.42 The Single Audit Act and its amendments eliminate what would otherwise be a significant compliance burden. But the Single Audit Act does not prescribe a particular data structure for the audit report, nor does it seek to allow Federal Audit Clearinghouse data to be used to prepopulate other types of grant reports. In 1999, Congress enacted the Federal Financial Assistance Management Improvement Act,43 which set up Grants.gov, a single portal for grant announcements and applications. The Federal Financial Assistance Management Improvement Act did much to centralize pre-award activities. An exploration of Grants.gov application packages reveals the vast majority to be comprised predominantly or even solely of common forms, though often with considerable space for attachments. The Government Performance and Results Act - Modernization Act of 2010 (GPRA-MA)47 was intended to streamline the original 1993 legislation and increase efficiency both within agencies and within the government performance improvement process itself. GPRA-MA requires agencies to create performance improvement goals aligned with their stated mission, and to create strategic plans to achieve those goals. This affects the federal grantmaking community in two ways. First, grant-based activity represents a significant portion of almost every agency’s mission which means that, at least in theory, tracking and improving the outcomes of an agency’s grants are included in its strategic planning. Second, GPRA-MA arose out of a growing movement towards implementing and refining evidence- based decision-making throughout government – a movement that is frustrated by the lack of comprehensive transparency in grant report data. In 2011, OMB issued Memorandum M-12-0148, which replaced the Grants Policy Council (1999) and the Grants Executive Board (2004) with the Council on Financial Assistance Reform (COFAR) as part of the President’s initiative on Delivering an Efficient, Effective, and Accountable Government. The intention was to create “an institutionalized, formal coordination body over Federal grants and cooperative agreements”49 which could not only represent the financial assistance community in federal government, but would seek solutions to the challenges faced by grantees and find ways to improve the processes and procedures through which federal grants are offered and administered. The COFAR was intended to improve both the efficiency and effectiveness of financial management “by coordinating the development and implementation of a standardized business process, data standards, metrics, and information technology” and by “eliminating unnecessary regulatory, reporting, and grant-agreement requirements and ... increasing flexibilities for satisfying grant requirements”50. Six years later, in Memorandum M-17-26 OMB disbanded the COFAR, and assigned its priorities instead to the Chief Financial Officers Council51. In 2014, Congress unanimously passed the Digital Accountability and Transparency Act (DATA Act)58, and President Obama signed it into law on May 9, 2014. The DATA Act is the nation’s first open data law. It directs the Treasury Department and OMB to create a standardized data structure for federal agencies’ spending information; requires every agency to begin reporting its spending as open data, conforming to the data structure; and mandates for the Treasury Department to aggregate and publish all this information as a single, unified open data set, covering the whole picture of executive-branch spending.59 Under the DATA Act, Treasury and OMB created a data structure known as the DATA Act Information Model Schema, or DAIMS.60 Every federal agency began reporting spending data files consistent with the DAIMS by May 9, 2017.61 By creating and imposing a common data structure for agencies’ reports on their own spending, the DATA Act has created a new means of government-wide spending transparency and data-driven management. The activities of this Section 5 Pilot Program form the basis for this paper’s recommendations and are further discussed below. The Grants Oversight and New Efficiency (GONE) Act of 201663 was intended to address the severe systemic issue of unclosed expired grants. It requires each granting agency to report to OMB, in conjunction with HHS, a list of every federal grant award they administer that has been expired for more than two years but is still listed as ‘open;’ the total number of open, expired grants, including by period of expiration; the total number that still have funds in their associated accounts; and the total number which have zero balances but remain unclosed. They must also submit a document describing the various roadblocks, systemic bottlenecks, and other factors which disrupt their ability to spend down and close grants in a timely fashion, and then identify and explain in specific detail the reasons why each of their agency’s 30 oldest grants have not been closed. The federal government’s first real step toward a standardized, open data structure for grant reporting did not originate with Congress, nor was it initiated by the government-wide grants policy leadership at OMB. Instead, the first demonstration of the potential for open data to improve information delivery and compliance efficiency came from the temporary agency that oversaw the federal economic stimulus program, which began in 2009. An adoption of financial reporting data standards and standardized business processes will reduce burden and improve efficiencies if implemented across the federal government. A centralized financial reporting system should allow for multiple electronic reporting mechanisms with an emphasis on bulk or batch XML filing. A unique award numbering scheme should be considered for government-wide implementation. This, along with more stringent data quality assurance measures within USASpending.gov, could enable seamless pre-population of some reporting data fields. The RAT Board’s conclusions reflected the experiences of only nine grantees. But, with the DATA Act, Congress set up a much larger test. The Uniform Grant Guidance sought to “increase the impact and accessibility of programs by minimizing time spent complying with unnecessarily burdensome administrative requirements, and so reorient recipients toward achieving program objectives.”79 While the UGG does ease conflicting guidance and regulation stemming either from previous memoranda or from minutely different phrasing or interpretation by agencies pushing regulations down to their grantees, its approach is inherently document-based. Even after the implementation of the UGG, and despite decades of grant-related policymaking, grantmaking agencies and grant recipients still rely on static PDF-based forms, and cannot call upon universally-accepted data definitions and attributes to automate their processes. As a result, information delivery and grantee compliance remain more elusive and more expensive than they need to be. With the DATA Act, Congress addressed the need for an open data transformation for the first time. When Rep. Darrell Issa and Sen. Mark Warner first introduced the DATA Act in June 2011,80 they proposed to create a new, government-wide open data structure for all federal spending information – encompassing both information reported by agencies and reports from the recipients of federal grants and contracts. The original DATA Act would have turned the RAT Board into a permanent government agency, directed it to set data standards for agency-reported and recipient-reported information, and empowered it to collect standardized spending data from both agencies and recipients.81 Had this bill become law, the newly-permanent RAT Board would have been able to directly implement its GRIP recommendations. To test whether an open data structure might reduce duplication and compliance costs, HHS created one: the Common Data Element Repository Library, or CDER Library.87 In essence, the CDER Library is a data dictionary, providing specific definitions to a set of terms which then allows those terms to be translated between agencies, departments, and different points in the reporting data stream. The concept is simple, and in some ways the process is as well. To create the CDER Library, HHS’ team set about initially to identify as many OMB-approved forms as they could within HHS. From these forms, they identified distinct data elements - those with either unique terms or unique definitions. 196 forms and element sources were selected for inclusion in the pilot from 18 different agencies, including HHS’ Administration for Children and Families, HHS’ GrantSolutions shared service, the National Institutes of Health, the Health Resources and Services Administration, the Department of Agriculture, and the Department of Education. HHS’ team also incorporated data elements directly from the UGG and from DATA Act Information Model Schema (DAIMS). 15,338 elements were identified from these sources, which were harmonized down to a total of 11,397.88 Within the CDER Library, each standardized element has an individual field label and attributes to ensure that meaning and structure is clear for both the people interacting with the data and the machines attempting to parse and analyze it. Recommendation 1: Continue to standardize data elements, conditions, and attributes to meet the statutory, regulatory and business needs of the various communities. Recommendation 2: Eliminate unnecessary duplication in reporting by leveraging opportunities to use information technology that can easily auto-populate from relevant existing Federal data sources. The findings of the Section 5 pilot program and OMB’s ensuing recommendations remove any doubt: the federal government will move forward, soon, to adopt a government-wide open data structure for grant reporting. However, the specific contours of the coming mandate96 and the timing remain uncertain. Similarly the CDER Library represents the government’s first conscious attempt at a government-wide open data structure, and the Section 5 pilot program results show that the attempt was successful. So, too, do the results of a pilot program conducted by the Environmental Protection Agency separately from OMB’s and HHS’ Section 5 activities. The CDER Library is not the only possible foundation for the necessary open data structure but it is, today, the best-developed. In 2016, StreamLink Software, the Environmental Protection Agency, and the Standing Rock Sioux Tribe partnered together to conduct a pilot program to test the use of standardized data to fulfill grant reporting requirements. The pilot program covered three single- fiscal-year grants from the EPA to Standing Rock, with awards totaling $1.1 million and grant terms from October 1, 2016, to September 30, 2017. All three grants provided reimbursements for environmental testing and cleanup activities conducted by Standing Rock. The EPA agreed to receive financial and performance information for these grants in the form of standardized data, submitted by Standing Rock within StreamLink Software’s AmpliFund software, rather than using the usual PDF documents. StreamLink Software incorporated selected data elements from the CDER Library into the software, and provided access to both the EPA and Standing Rock. Like many federal grant agreements, the three pilot grant agreements each dictated an agreed budget and required Standing Rock to report on its progress against that budget every quarter, and then receive reimbursement from the EPA for specified expenses. Using CDER data elements, AmpliFund handled this whole process. Standardization improved the process in three key ways. Normally, the agreed budget for a grant is separately maintained by a grantor agency and its grantee entity, and both grantor and grantee separately track the impact of the grantee's qualified transactions on that budget. But with a standardized data structure loaded into AmpliFund, both Standing Rock and the EPA were able to view the same budget, saving effort. Normally, a grantor agency does not know what its grantee is doing until it receives a quarterly request for reimbursement. But through its access to AmpliFund, the EPA could track Standing Rock’s transactions in a much more timely fashion. Normally, a grantee must manually prepare a quarterly request for reimbursement, by extracting data about its transactions from its financial systems, turning that data into a spreadsheet, embedding that spreadsheet into a document, and submitting the document to the grantor agency. But here, Standing Rock was able to simply press a button at the end of each quarter to certify to the EPA that its transactions for the quarter were complete, and that a reimbursement was due. Standing Rock used AmpliFund to compile its required SF-425 form, the annual report, for each of the three pilot grants. Normally, a grantee must manually extract data from its financial systems, compile it into spreadsheets, and embed those spreadsheets into a document in order to create the SF-425 submission. But here, AmpliFund sourced the necessary information from Standing Rock's financial systems and created an electronic version of the SF-425 conforming to the CDER data elements. Upon publication of this research report, Standing Rock intended to submit electronic versions of the SF-425s for each of the three pilot grants to the EPA electronically, within the software. Standing Rock also used AmpliFund to track its progress toward completing the specific deliverables specified in each grant agreement, and keep the EPA informed of that progress. The EPA could see Standing Rock's progress through its access to AmpliFund. Normally, a grantor agency cannot see its grantee's progress toward meeting the performance goals or deliverables of a grant until the grantee completes and submits a report at the end of the grant period. But here, the EPA could easily see Standing Rock's progress toward each deliverable, as the work was done, all throughout the grant period, and the final report merely confirmed what the EPA had already been tracking through its access to AmpliFund. Normally, a grantee must manually compile performance reports before the end of the grant period and turn them into a document, and then submit that document to the grantor agency. But here, AmpliFund both served as a project- management tool for Standing Rock's performance and also automatically generated a summary at the end of the grant period that fulfilled Standing Rock's obligation to submit summary reports. The pilot program is now complete. Standing Rock and the EPA are currently considering making this arrangement permanent and extending it to other grants, including possibly grants from other agencies. Reporting both financial and performance details in a standardized, open data structure, embedded within grant management and reporting software, was much cheaper for the grantee, Standing Rock, than undertaking the same compliance tasks using the conventional PDF documents. The EPA benefited, too. Rather than having to receive document-based reports from its grantee and input the information from those reports into its systems to create financial and performance data, the EPA got instant access to that data in a single software environment, for automatic and comprehensive transparency. The pilot program demonstrates that AmpliFund, and other grant management software solutions, can use standardized data elements to reduce grantees’ compliance costs, improve transparency for grantors, and benefit all taxpayer and the constituencies that depend on grants. Undoubtedly, there are challenges to be overcome. As with any significant process change, financial cost is chief among them. While the technology necessary to transform the whole reporting environment exists, and in fact has for more than two decades, there are significant variances in capacity within and across stakeholder groups. Some federal agencies, as well as state and municipal grant management offices, have lacked either the funding or the foresight to incorporate the use of standardized, open data frameworks in their strategic IT planning - particularly in regards their grant management systems - and may be at least temporarily locked into systems which are expensive or even resistant to overhaul due to inflexible structures. Moreover, well-intended attempts to alter cascading systems have historically been prone to becoming unfunded mandates. When cost-saving measures require an initial outlay that is not incentivized by cost- sharing, if not full funding, the resulting implementations are often slow and functionally incomplete. This can cause benefits to go unrealized, new duplications to arise from the creation of parallel systems and their associated administration, and additional spending which cancels out anticipated savings. Awareness is also a significant challenge. A continued paucity of outreach will perpetuate a compliance- oriented culture. Buy-in is most easily gained prior to a mandate, which can sound like an increased burden instead of an improvement if it appears seemingly overnight as a fait accompli. While some states are turning towards integrated systems and forward-thinking technology solutions, many agencies and organizations are not aware of the ongoing efforts towards standardized, computer readable data and assume they would be working in a vacuum were they to attempt to address these issues. Further, at all levels of government there is an entirely right and necessary focus on oversight and accountability, but this has resulted in the accumulation of redundancies placing undue burden on grantees. Even with recent revisions to the Single Audit Act, it is not uncommon for nonprofits (particularly smaller organizations which do not meet the Single Audit threshold and on whom excessive burden weighs heaviest) to be under some variety of financial or compliance audit for most of the year, as each of their grantors perform uncoordinated independent reviews. Each jurisdiction, be it federal, state, or municipal agency, has slightly different requirements for statutory and programmatic compliance. This in and of itself is logical, as each maintains separate authority, autonomy, and governance over programs it funds through its own resources, but the significantly overlapping nature of said requirements indicates that even a partial coordination of related systems and processes would improve what is currently an extremely inefficient system, and a significant drain of time and resources for all involved. Finally, and perhaps most significantly, grantees’ ability to present a narrative must be addressed. In any discussion about standardizing data, there is always concern from grantors and grantees about lost narrative. Narrative is an intrinsic and crucial feature of grant reporting. Almost all grant reporting contains narrative components, and it cannot and should not be forsaken in favor of a purely quantitative system. Baselining and benchmarking can only be done through quantitative analysis, and our capacities in those areas must be improved if there is a desire to make well-informed, impactful changes to programs. But context is everything when discussing impact and outcomes, and even the most efficient, accurate national and regional baselining and benchmarking cannot provide sufficiently current or nuanced understanding of prevailing conditions as to render narrative unnecessary. There is likewise concern about narrative and context in the higher levels of federal agencies, and particularly around the topic of governance. Specifically, it accompanies any discussion of the current lack of governance, which over time has become a glaring omission. Grant spending has surpassed acquisitions, yet the latter has a statutorily defined governance organization and the former does not. The objections to consolidated governance generally hinge on diversity. As discussed earlier, often even within agencies the goals and outcomes of programs are so disparate as to seem incomparable. The concern is not unfounded - a simplistic, one-size-fits-all solution would be not only unworkable but counterproductive. But simplistic, one-size-fits-all solutions are not the only ones available to create a governance structure for federal grants and other forms of financial assistance. Despite all these challenges, it is clear that the federal government should, and soon will, embrace an open data structure for grant reporting. The federal grant system as a whole is creaking under the weight of the reporting status quo, which disadvantages every group involved. Standardized, computer-readable data is crucial to rectifying the many issues of disparity, duplication, infidelity, and incomplete communication. While not without its challenges, more concerted effort must be made to ease the administrative burden incumbent on all federal grantees, and that effort must begin by liberating data from static forms and implementing a data dictionary across the all federal grant agreements. More efficient use of the considerable funds expended by the federal government on grants can be achieved at every point and for every stakeholder with open, machine-readable data. From faster and more accurate reporting to lower costs for compliance and data storage, and from better oversight to better insight, static PDFs and unmapped data hamper the development of improvement culture and waste money which could otherwise be allocated to crucial programs. The movement towards open and standardized data in government is well underway, and the realm of federal grants will soon join it. Before moving into the government arena, Jenata Spencer spent more than five years as a nonprofit consultant in Washington DC, specializing in grant writing, full life-cycle grant management, and data collection and analysis. As the Grant Innovation Fellow at the Data Foundation, Ms. Spencer worked with federal, state, nonprofit, and technology stakeholders to understand the inner workings of the nation's granting systems. She is grateful for the support of the many people who were instrumental in the creation of this report for their willingness to share their time and knowledge. Ms. Spencer currently serves as a Grants Business Analyst at REI Systems, where she uses her interest in automation and data to help government clients leverage technology to improve their processes, insights, and outcomes. Hudson Hollister is the founder and Executive Director of the Data Coalition, a trade association representing technology and consulting firms supporting open data in government. The Data Coalition is the main advocacy group for the implementation of the DATA Act of 2014, transforming the U.S. federal government's spending information into standardized, open data. The Data Coalition also supports data standards to transform regulatory compliance, legislative mandates, and the whole landscape of government invitation. Mr. Hollister has helped to craft landmark reforms, including the DATA Act, the OPEN Government Data Act, the Financial Transparency Act, and the Grant Reporting Efficiency and Agreement Transparency (GREAT) Act. Mr. Hollister is also the founder of the Data Foundation, a nonprofit think tank seeking to define an open future for both government and private-sector data. The Data Foundation is responsible for the leading research on open data in federal spending and in regulatory compliance. The Data Foundation hosts the largest annual open data conference in the United States. This document contains general information only and the Data Foundation is not, by means of this document, rendering accounting, business, financial, investment, legal, tax, or other professional advice or services. This document is not a substitute for such professional advice or services, nor should it be used as a basis for any decision or action that may affect your business. Before making any decision or taking any action that may affect your business, you should consult a qualified professional advisor. The Data Foundation shall not be responsible for any loss sustained by any person who relies on this document.